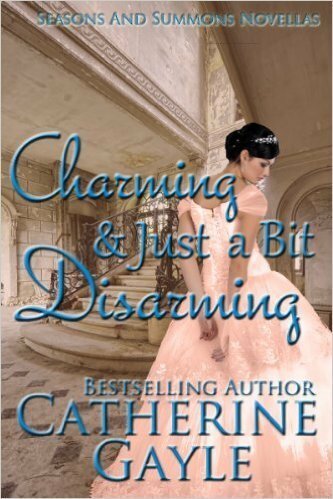 CHARMING AND JUST A BIT DISARMING is a collection of three novellas. Each of these novellas was previously featured in other anthologies. An Unintended Journey, originally featured in A SUMMONS FROM THE CASTLE. Flight of Fancy, originally featured in THE BETTING SEASON. Cedric Loring, the Earl of Montague, has been an honorary member of the Bexley-Smythe family for years. He’s always had a special, if sometimes strained, bond with Georgie. But when her name ends up in the betting book at White’s before she’s even made her debut, he knows no one can protect her quite like he can. If only she’d stop chasing after the very gentleman who could single-handedly see to her ruin. Lady Georgianna Bexley-Smythe has the uncanny ability to remember nearly everything she’s ever read, and thus knows everything about almost everything. But as knowledge and experience are not interchangeable, she intends to make her first Season one of adventure. What could be more adventurous than seeing London from Lord Haworth’s gas balloon? Now she must avoid Monty long enough to make Haworth’s acquaintance and beg an airborne adventure. To Enchant an Icy Earl, originally featured in A SEASON TO REMEMBER. As the Earl of Fordingham, Tristan Cavendish has lived by the code his father beat into him for so long he’s driven everyone in his life away, including his brother. Now he is alone. Loneliness dictates he must change, so he sets out to make amends with his only sibling. Alas, his brother seems none too inclined to hear him out, and a woman who must be a vision from Fordingham’s dreams walks into his path. Now, more than ever before, he knows he must change his ways or risk driving her away as well…but how? Calista Bartlett is on the hunt for a husband—but one who is nothing at all like the betrayer who was her former beau. When she sees the Earl of Fordingham across the room at a soiree, she knows she’s found the very man who is everything her one-time beau was not. Fordingham presents an icy façade to the world, but Calista discovers a passionate man who kisses her feverishly and warms her through to the bones. Can she ever convince him to let down his guard permanently?